Improvements brought the the design of the bowl in the skatepark of the Lloque Yupanqui zonal park, in Lima, Peru. Design of a streetpark for the "parque zonal Sinchi Roca", in Lima, Péru. Beginning of 2014, Arne Hillerns, from the NGO Make Life Skate Life, contacted us to ask a support by spreading the call for volunteers in South America, for the diy project building the "Skatepark de Purapura", in La Paz, Bolivia. This is how participants joined from Peru, Equador, Colombia, Venezuela, Brazil and Argentina, as a consistent Southamerican delegation. 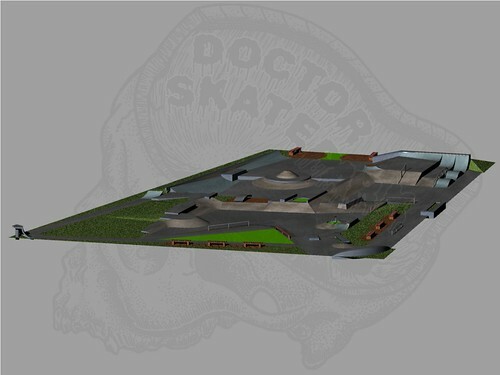 We're back in Peru, working on the construction of the skatepark in Ventanilla, Lima, original design by Doctor Skatepark. Construction start: May 2014. Approximate duration: 4 months. Doctor Skatepark team recently set up the street course for the event Adidas The Obstacle Lima 2014 that will be held on Friday 6, Saturday 7 and Sunday 8 of June, as a part of the Pura Calle festival. Redoing and remodeling of the skatepark at 'Aterro do Flamengo', Rio de Janeiro, with Rio Ramp Design. Images of the construction follow.